Save on Light Bulbs at Defy Now, Page 4. Top brands include E2INTL. & E2INTL. Hurry! Limited time offers. Offers valid only while supplies last. 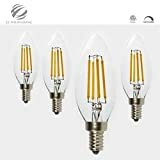 E2INTL LED Candelabra Bulbs, E12 LED Filament Bulbs, Pack of 4 - C35 Candle Light Bulbs, Triac deep dimmable, 2700K, 4W (40 Watt Incandescent Bulb Replacement), Tested and ETL Listed for Safety.